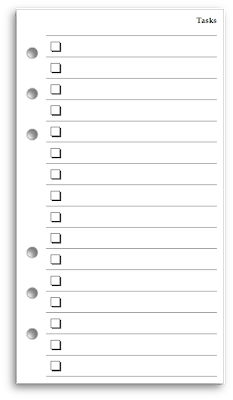 One of the things I learned when building this Midori diary layout was that I prefer my task list checkboxes to be on the left of the tasks rather than on the right, as they normally are. It's a much stronger visual indication the task is complete; if there's a tick in the box, your eyes don't even scan the task itself. 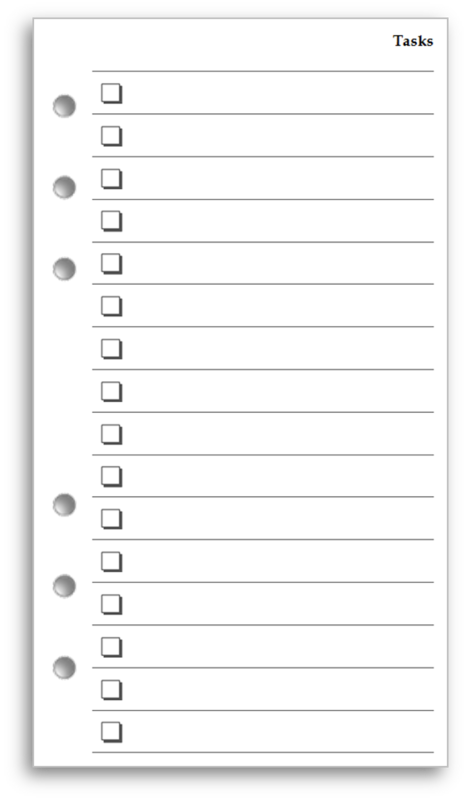 As well as moving the position of the checkboxes, I've given them a drop-shadow and provided 16 rather than 12 task spaces per page. The page will print double-sided, two-to-a-page on A4 paper. You can download the pages as either an editable Word file or a PDF file. If using the PDF versions remember to set your printer settings so as not to shrink the pages. Each file should be printed double-sided with the duplex set to flip along the short edge. You can then cut out and punch individual pages. Much better. I never understood why the boxes were on the right. Much less satisfying.